I've been a Glen Beck fan for a long time. Not because I agree with him, but because I think that he is entertaining. The same kind of entertaining as Bill O'Reilly. I used to watch Glen everynight when he was on Headline Prime right after Lou Dobbs. Which I still think is the strangest back-to-back lineup ever. "Is Glen Beck Dangerous for America?" He is about as dangerous as Bill or Keith Olberman or Rachael Madow or the women on The View. They all reach a huge audience, but I don't think their impact is strong enough to "rock the boat". Interesting take on Glenn Beck. The View scares me too! Glenn Beck was influential enough to make a White House advisor resign for some stupid stuff he did in his past. Pair that kind of power with some of his wackier statements about politics and society, and you've got a recipe for disaster. 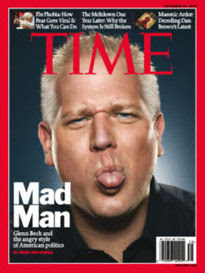 Glen Beck is hilarious. If I didn't know better I would swear he was the most genious comedian since Andy Kaufman. He is a screamingly ridiculous parody of himself, and the fact that people take him seriously makes him even funnier. That being said, the fact that people take him seriously also scares me half to death.